How rowing brought us halfway around the world. In July of 2018, we went to China, having been invited by the Deep Dive Rowing Club and the Organizing Committee to participate in the 2nd annual World Leading Universities Regatta. We wanted to share that journey with you, so we wrote this. Long ago — really only about four months ago — a rowing trip to China was barely a rumor that many of us were hopeful of, yet did not have any expectation of it actually happening. It was something that seemed to have so many barriers to becoming an actual possibility. However, through the devoted planning by Emily Charnowski, one of the BC Club Sport directors, our tripbecame a reality. Emily became our Team Manager for the trip and coordinated visas, travel information, and was our point person for all communications between the team and the regatta coordinators in China. In the weeks leading up to the trip, we relayed all of our personal information and Emily made sure everything was accurately submitted. Having received our visas and plane reservations we were nearly ready to embark on our trip to China, but first we needed to go through an informative cultural training to prepare us for any new interactions inthe foreign country. Prior to departing for China, we were asked to attend a cultural training seminar on campus on the Wednesday before our departure. 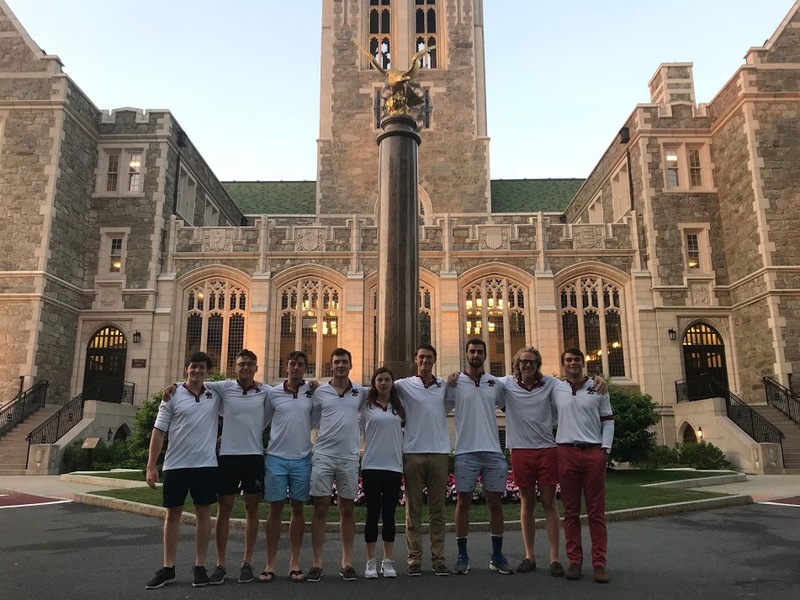 All eight rowers, our coxswain, coach, and team manager met with BC’s own, Caitríona Taylor, the Director of Campus Rec, and Kelber Tozini, a Graduate Assistant at the Center for International Higher Education at BC. Caitríona and Kelber prepared a series of activities and learning exercises that worked to address our prior conceptions and knowledge of the Chinese culture. Through demonstrating the countless and occasionally bizarre, different ways to make a peanut butter and jelly sandwich, we came to the common understanding that many cultures may approach common daily actions quite differently. Anything from dinner table manners to expressing signs of respect may differ culturally and should not be judged approvingly or disapprovingly for such differences. We also participated in an interactive quiz of China, and at times we were surprised by our lack of basic about the country. We learned about the different cultural sentiments regarding collectivism, independent thought, uncertainty, pragmatism, indulgences and many other social norms between China and the United States. Throughout this seminar, we collectively addressed our expectations of our upcoming trip and created personal action plans to maximize our openness to any new and challenging cultural interactions. In this preliminary seminar, two current BC international students from China also took the time to present to our group important colloquial understandings of the country. We learned, and would later witness on our trip, the common practice of Chinese women collectively dancing in the streets and park squares after the evening meal. These students taught us important phrases in Mandarin that would help us navigate basic social situations in China. Most importantly, they taught us how we could barter for goods in Mandarin and make sure that no one was selling us exorbitantly over-priced goods. Having completed this cultural seminar together, as a whole group, we felt far better prepared for our trip to China. We realized any of our prior conceptions or expectations of China and understood ways in which we could enter the country with more open minds. Throughout our trip, the lessons learned from the seminar proved paramount as we interacted with the international teams, Chinese students, and locals in the cities we traveled to. Our group cannot thank Emily, Caitríona, and Kelber for coordinating such a fantastic trip and informative pre-trip seminar. 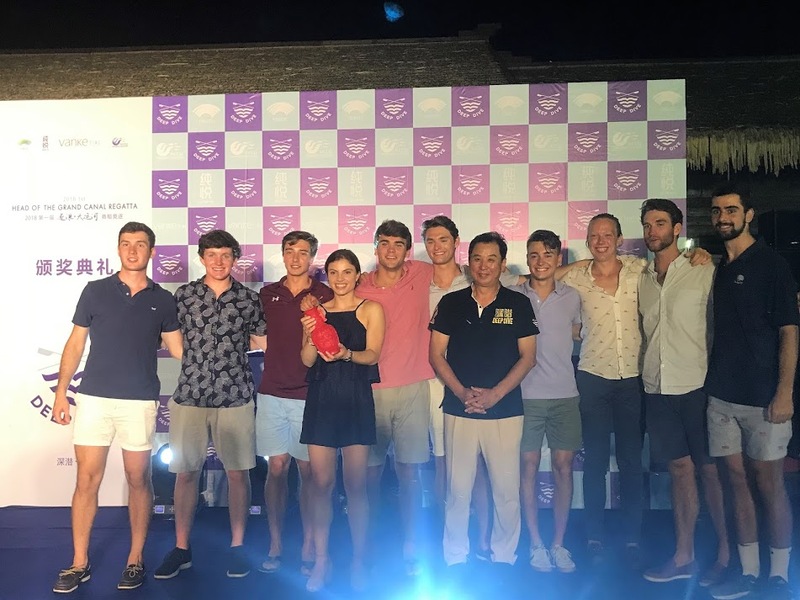 After much anticipation, the Boston College Men’s Crew trip to China started very early on the Fourth of July, 2018. At 5am we took an Uber to Boston’s Logan Airport for a six and a half hour flight to San Francisco. After a short layover in the Golden State, we embarked on a thirteen hour flight to Shanghai during which I watched 6 movies back-to-back, and snacked upon endless bags of peanuts. You already know we had to get that Gassongram before we left. 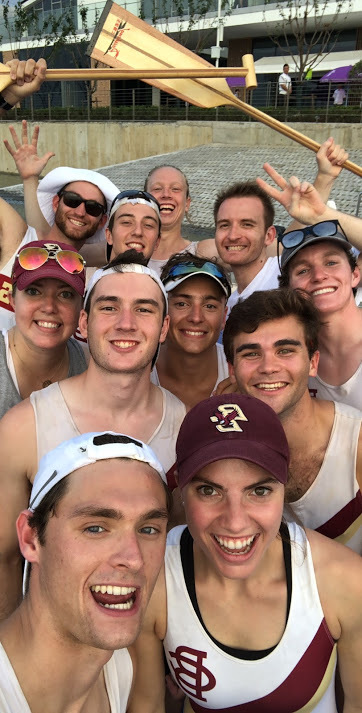 Pictured from left to right: Matt Poindexter (sophomore, bow), Kyle Wiant (junior, 2 seat), Alex Chansky (senior, 3 seat), Sean Bradley (sophomore, 4 seat), Sophia Bicks (junior, coxswain), Alex Martin (junior, 5 seat), Gavin Cunningham (sophomore, 6 seat), Steven Wagner (junior, 7 seat), and Henry Hawley (junior, stroke). Not pictured: Emily Charnowski (team administrator), Alex Dillon (Head Coach). Upon first landing at the Shanghi Pudong International Airport, the largest airport in China, we were all blown away by the cavernous terminal, sheer size of the building, and surprising lack of air-conditioning. During our five hour layover we got our first taste of authentic Chinese food, and had a chance to meet a young boy who was extremely outgoing and became an instant Boston College rowing fan. He is prominently featured in many of our airport photos. A scene from our long layover in Shanghai, featuring BC Men's Rowing's newest fan (and our dear friend), Neil. We discovered our traveling was far from over when the final flight to Nanchang was delayed an extra three hours. However, during this time we had a chance to meet other international teams attending the Regattas including, the University of Sydney, the University of British Columbia, Oxford University, and the University of Cambridge. After 38 hours of traveling, we finally arrived at “The New Century Kaimei Hotel” in Nanchang at 5am, local time. There in the beautiful lobby we first met our faithful guide and trip organizer, Ken Lee. Despite having stayed up all night to greet us, Mr. Lee was extremely upbeat, friendly, and excited to finally meet us. The hungriest of us decided to put off sleep for just a bit longer and stay up for an extra 30 minutes to feast upon the hotel’s complimentary breakfast at 6am. The breakfast was a spectacular display of food ranging from fresh watermelon to dumplings and Lo Mein. At 6:30am, we finally checked into our rooms and instantly fell asleep dreaming of practice in a matter of hours. Although the travel day stretched into two days, we were all extremely excited to experience Chinese culture and compete in the Regattas. We woke up around 11:45 after our long day(s) of travel, and I went right to the bus which was leaving at noon. The boathouse we were heading to was just across the lake that our hotel overlooked. The lake seemed out of place among the towering high rise apartment buildings, which house 5 million people. We arrived to the boathouse after a short ride, lasting all of 5 minutes. As we walked through the gates onto the boathouse grounds, we were awe struck by the massive posters and billboards, that draped over the main shell house. 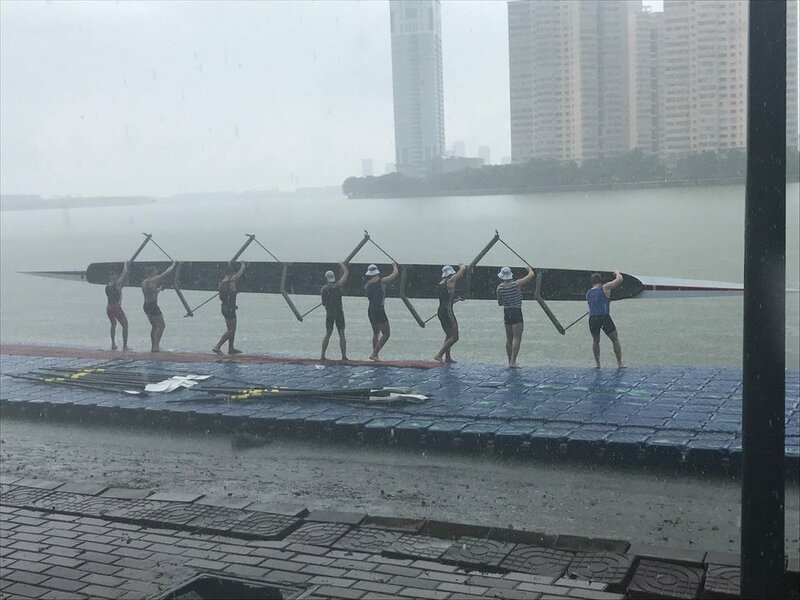 They read: 2018 Nanchang-OCT VANKE CUP-World Leading Universities & 2nd Masters Regatta. Right in the middle of these magnificent banners were the crests and logos of the schools competing. The poster proudly displayed the 7 international crews who had traveled up to 38 hours to get there: BC, Harvard, Oxford, Cambridge, University of British Columbia, Sydney University and University of Tokyo. One of countless banners and backdrops scattered around the boathouse. The crests below the international schools are those of the 9 Chinese universities that sent crews to race in Nanchang. After we finished taking pictures, we headed to the boats the generously provided for us by the organizers. We had to adjust the rig (the way the boat is set up), because our crew was larger than the group who normally rowed that boat. Immediately as we touched the boat, the dark clouds opened up and rain fell so quickly the boat began to fill with water. We hurriedly finished rigging, poured out the water, and walked the boat to the edge of the lake. We carefully stepped into the shell, and set off for our first row in Nanchang. We took our first few strokes to get the rhythm of the group and set off doing drills. We found the equipment to be slightly different, especially the pitch of the oar blades, which was angled slightly towards the stern. As we started to build up the power, something I have never even considered as a possibility happened. A giant fish exploded out of the water and landed directly on my legs. I stopped rowing and just sat there as it bounced around in the boat, thinking to myself, god I hope this thing doesn’t have teeth. I quickly scooped the fish up and tossed it out of the boat, but not before it could coat my legs and the side of the boat with slime. We rowed back in and put the boat away. We then headed back to the hotel for a nap and then dinner. By the time I reached my room, I was so exhausted I forgot to turn the water in my shower to warm and didn’t realize until I was done. I then laid on my bed and passed out immediately. I awoke to Sean, my roommate for the trip, watching the live stream of Henley Royal Regatta, one of the most famous regattas in the world. We got into some fresh clothes and went to dinner with the team. Dinner was fun. We got a chance to meet some of the guys from UBC and Sydney. We chatted about rowing within our respective countries and how tired we were. Our temporary home: the Grand New Century Kaimei Hotel, towering above the lake where we rowed in Nanchang. After dinner we got a chance to walk around the city. We walked along the lake for 45 minutes or so, then ventured away towards the bright beckoning lights from deeper in the city. We went into shops and found countless things in which you would never expect to see back in the States, chicken feet, interesting drinks of every color and flavor, pretty much anything you could imagine. We started to head back as we were incredibly tired and had a fairly early morning ahead of us. By this point it had officially sunk in. We were in China, one day from racing some of the best crews in the world. My phone alarm woke me up at 6:30AM. It took a minute for me to remember where we were, and another minute to convince myself that it was real. I rolled out of bed and wandered over to the enormous windows that took up most of the exterior wall, and sat there for a while, trying to get my bearings in Nanchang. I took this picture of the skyline, then got dressed for the forum. One of the coolest hotel window views I've ever had. The complex on the lake shore in the far left of this photo is the boathouse we raced out of. Sean, Steven, Gavin and Sophia volunteered (read: were voluntold, by me) to come along for Q&A with the audience after I presented, and Emily joined us as our photographer/videographer/moral support. While most of the others had gone for a walk through the neighborhood surrounding the hotel, I had spent the previous evening alone hastily revising and retyping my notes for the presentation. At breakfast, I scribbled down my final notes in a small notebook, and ran through the slideshow with our faithful translator, Olivia. Then, the six of us boarded the bus to the forum, along with a few of the Harvard alumni. Anderson, their coach, turned up in a Henley blazer layered over a unicorn hoodie complete with a horn, intermittently doing breathing exercises through a neon pink bendy straw. I felt wildly underdressed in khakis. But we were committed at that point, and I spent the rest of the bus ride gaping at the scale of this country. Nanchang is a relatively small city by Chinese standards. It doesn’t even crack the top 15 list. But its 5 million inhabitants would make it the second-largest city in the US by a long shot. Its hard to understand the sheer size of 1.38 billion Chinese citizens until you see the implications in person. In any case, we made it to the forum, and I stumbled through my presentation as best I could. To my relief, the audience seemed fairly engaged, and quite a few people asked questions during the Q&A about life as a university student in the US. After the presentation, we were invited to participate in a calligraphy demonstration, in which we tried our best to copy down “Boston College” and “Ni Hao Nanchang”. Out here just trying my best. The nice thing about speaking through a translator is that nobody in the audience knows when you mess up. I hope. After lunch at the hotel, we were treated to a tour of Nanchang University. 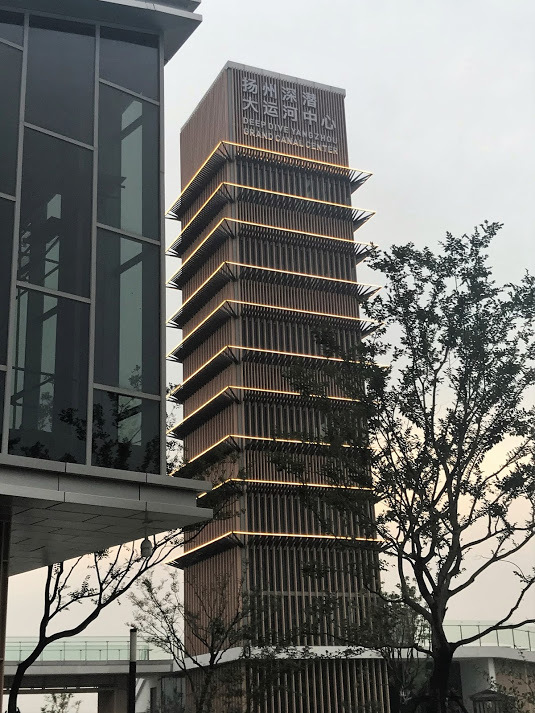 Then, those of us who went to the forum visited the Pavilion of Prince Teng, Nanchang’s biggest tourist attraction and one of the famous “Four Great Towers of China”. Originally built in 653 AD as a townhouse for the imperial prince at the time, the building has been destroyed and rebuilt 29 times in the last 1,300 years, most recently in 1989. Following dinner at the hotel (now back with the whole group), the organizers arranged for us to participate in a tea ceremony; basically, we learned the traditional Chinese way to drink tea. Chansky won a tea set which I have yet to see him use at home, but I’m excited to see his mastery of the ceremony. We were all given these awesome porcelain apples (for good luck and safety, we were told). Gavin and I discuss the many merits of porcelain. Unfortunately, the stem of my apple broke on the flight home :(. If anyone knows a good porcelain repair service, hit me up. Then, it was time for bed. Apples in hand, Steven and I retired to our hotel room, as the excitement and anticipation of race day loomed ahead. We had no idea what we were in for. In classic coxswain fashion, Sophia will now describe our first race day, using far too many words. Saturday, July 7th: the day of the World Leading Universities Regatta, our first official regatta in China! We all sat together at breakfast, no one knowing what to expect for the festivities today. We had heard that this regatta had been hyped up for months in the city of Nanchang, and it was evident they had been advertising it by all of the banners hanging throughout the city, but we had no idea how grand of an event it would be until we first arrived at the boathouse. Down at the lake, a huge stage had been setup and in front of the stage stood a rowdy crowd of rowers, officials, and even cameramen! Yes, people were filming and taking pictures of us wherever we went; we were truly a sight that Nanchang wanted to see! During the opening ceremony, each team stood in a line in front of the stage and the directors of the regatta gave their opening remarks. Then, the regatta was officially opened by the blast of confetti out of cannons from both sides of the stage! As if that wasn't elaborate enough, the Olympics theme song was blaring in the background, adding to the amusement on all of our faces as we finally realized how grand and important of an event this was. To further add to the extravagance of the day, each team was put up in a private room to prepare for the races. They were furnished with leather couches, marble tables, and perhaps the most important item, a karaoke machine, which Kyle eagerly took charge of. Absolute bedlam. As any opening ceremony should be. Our first race of the day was a 1000m sprint. The boats supplied to us were not equipped with a microphone, so even though the length was half of our usual races, my voice was not looking forward to it. Now, rowing starts are generally very quick, but only seconds after we had gotten to the start line, the official announced “Attention, Row!" Despite the abrupt start, we rowed away with a second place finish, landing us a spot in the final. The final was also a 1000m sprint and we were up against Harvard, UBC, Sydney, and Tokyo. Looking around at all of us on the water together, sharing one passion, one goal, was when it really hit me how unique of an experience this trip was. We were rowing a mere 1000m in China against countries we had never even been to and yet we were all bonded together simply by our love for rowing. The three minutes went by in a flash and UBC had claimed victory with Sydney taking second and Tokyo third. We followed closely behind Harvard, taking fifth overall for the 1000m event. Rippin' stick with the boys. A few days ago, we would have thought that this was the conclusion of our rowing for the day. However, last night we had been advised that the officials were throwing in a special surprise for us: an extra 6000m head race! But wait, there’s more! There was going to be a 180 degree turn 3000m into the race. Being the coxswain, this sounded like a complete nightmare. It was hot, the guys were tired from the two races, and a 6k was the last thing we wanted to do. However, to the organizers’ delight, we all prepared for one final race in Nanchang. The 6k went smoothly for us, but not all teams were as lucky. The 180∞ turn was the most chaotic scene I had ever witnessed on water; boats simultaneously trying to spin around a small buoy while also trying to avoid major crashes. I decided to take our turn a little wide and avoid the mess, and to my delight it was a great payoff as two Chinese boats behind us completely T-boned into one another. Although Harvard had avoided a crash, they found themselves in a "fishy" situation. (Editor's note: the rest of the team does not condone this pun.) A fish had jumped into their boat mid-race and while trying to push it out, one of the rowers had lost control of his oar, causing the oar to slam into his face and create a nasty cut across his cheek! We came out of the race with no crashes, no scratches, and a sixth place finish. The racing was an amazing experience, but safe to say, everyone was looking forward to returning to the hotel for the continuation of festivities. Back at the hotel, everyone quickly got ready for one of the anticipated highlights of the trip: the gala dinner. Let me say right off the bat that this was one of my favorite nights in China, and not just because all the guys looked great cleaned up in their suits and ties. The gala was filled with round tables, one for each team, and even more in the back for other participants from today's events. But the biggest show took place on the large stage at the front of the room. To kick off the dinner, there was a beautiful Chinese dance performance. The directors then came on stage to recall the events from earlier and give their thankful remarks, then inviting UBC on stage to collect their medals. After all of the announcements and applauses, it was time for the real show to begin. The whole gang, including our translator, Olivia! Prior to the trip, each team had been told to prepare a skit to perform and now was the time for everyone to shine. The performances could not have been more distinct and diverse from one another. Oxford recited a poem while Cambridge performed a traditional English childhood dance. A Chinese team went up and sang while Canada coordinated a dance to "1-800-Hotline Bling" by Drake. The Australians rallied the crowd with a musical performance of a famous Australian medley, featuring their Olympic rower playing guitar and the rest of the team happily belting out the lyrics. We were given the honor of having the last performance, and I can proudly say that we did not disappoint. We had collectively decided that the Cha Cha Slide would be a great choice as it is an iconic and classic dance to Americans. The Australians had hyped up the room, and that energy carried through to us. The guys and I got up on stage and did the best Cha Cha Slide you could imagine. What made it so memorable was that other teams came up on stage to join us and the crowd was absolutely loving it. It was an incredible feeling to see just how much joy a simple dance like the Cha Cha Slide could bring to so many people that had never heard of it. The main director, Ken Lee, had even said that it was his favorite performance of the night. Everyone absolutely in their element, minus Sean, who looks nervous. From there on, the night was filled with great conversation and endless laughter. Not only did we have a great time interacting with one another at our table, but it was great to be able to roam around the room and interact with the other rowers on a more personal level and truly get to know them. The gala dinner was the perfect event to wrap up the long day, providing us with laughs and cherishable moments that we will gladly carry back with us to the United States. The morning of our departure from Nanchang was like the others we had already experienced: hot, humid, and continuously threatening to rain. Our train for Yangzhou was departing in an hour, so we ate a hurried breakfast. After, we boarded a bus for the train station. For me, the last bus ride through Nanchang was incredibly reflective. I tried to absorb all that I could of the first Chinese city I had seen: the stores, the scooters, the men with their shirts rolled up and resting on their bellies. I was still almost in shock that we were actually in China, and I wanted to see it and know that it was real. Walking through the train station with Adam, one of the Harvard alumni, second from the left in the background. All of his other teammates left the regatta early to go back to their "jobs" and "careers", so we happily took him in as our foster child. We arrived at the train station to see that it was just like any other train station I’ve ever seen. Train stations and other transit centers feel the same, regardless of superficial distinctions. After going through security, we boarded the train. Once again, the train’s interior offered very little difference to its American counterparts. However, once the train got up to speed there was a marked change. It was much smoother and quieter, which only added to our shock when we saw that we were traveling at 300 km/h. I was personally excited to see a bit more of the countryside. Our train took us through rice fields and villages and towns. Perhaps the most jarring thing to see was the construction that was taking place. We’d be traveling through some rural place when out of nowhere there’d be a collection of 25 story tall apartment buildings. Whether they were full or vacant, we never knew. The train gave an amazing opportunity to get a glimpse, albeit fleeting, of life outside of an urban area. After four hours on the train, we reached Yangzhou and another train station. We checked into the hotel then went to the boathouse for a quick practice. We got to the boathouse and were immediately in awe. The building was large, sprawling, and decidedly modern. We all agreed it was probably the nicest boathouse we had been to. The absolutely gargantuan finish line tower at the boathouse. A $200 million facility, one of seven being built around China. Unfortunately, our revery was stalled by the start of a massive rainstorm. We rigged our boat in the bay and waited patiently for the downpour to end. In the meantime, some of the team wandered around the boathouse to see the extensive facilities. Eventually, the rain ended, and we rowed. Once our practice was over, we returned to the hotel, showered and left for dinner. Perhaps the most striking part of the meal wasn’t the vast spread of unfamiliar foods but the beverage: heated up orange juice. This was such a simple challenge to our preconceptions of what orange juice is and how it should be served (preferably chilled). Needless to say we were floored. After our initial apprehension with the juice, we drank and enjoyed it. I think Matt drank at least 3 or 4 jugs worth by himself. In addition to the juice, we were served a full meal of delicacies. Fish still connected to its skeleton, an entire chicken in a bowl, a mass of some sort of meat that we later found out to be pig’s intestine, we ate it all. We spent a lot of the meal asking the interpreter what certain things were and how to eat them. I think that we all found that sharing a meal and talking about food was one of the best looks into Chinese culture. The entrance to the district where we had dinner. Our second day in Yangzhou was one of the more eventful days of the trip, starting off with an erg relay and finishing with a poolside barbeque. Similarly to Nanchang, the second day of racing was to consist of some shorter pieces in the morning with a longer head race in the afternoon. Once we got to the boathouse we were treated to a sort of grand opening for the new facility before the stage was handed over to Kyle and a representative from each of the other schools to give a presentation on their respective universities. The speaker from Sydney University was Alexander “Sasha” Belonogoff, a silver medallist in the Men’s Quad from the Rio Olympics, who delivered a powerful message about the role of sport in his life, and how to appreciate and find small successes within failure. A popular Chinese television host then came out to do a panel discussion with a representative from each university. Topics during this discussion ranged from thoughts on the competitiveness of the Chinese teams we had seen so far to the merit of sport itself in a country that places so much emphasis on education. Kyle Wiant '20 (seated, far left) once again trying his very best to remain composed, this time on Chinese television. After the panel discussion wrapped up, the stage was whisked away and the erg relay was upon us. The relays were short, fast, and with the exception of an untimely injury, fun. Each university selected 6 rowers to row 200 meters each for 1200 meters total, fastest time wins. Alex Martin went out guns blazing and shot us into second place at the first change over, where Gavin Cunningham hopped on and proceeded to YANK SOME CHAIN. Sean Bradley, Alex Chansky, and Matt Poindexter rounded out the middle guys, but left the Eagles sitting in 5th place with only 200 meters left. Henry Hawley hopped on the erg and started to claw back into the other teams, passing Cambridge and Oxford within his first hundred meters. With two strokes to go he passed Sydney, sending us into a frenzy and securing second place behind British Columbia. The final standings after Henry "Hammer" Hawley's incredible sprint finish. After the excitement of the finish settled down a little, we discovered that Gavin went a little too hard and ended up aggravating a previous back injury leaving him unable to row in the head race that afternoon. Thankfully, Coach Alex Dillon volunteered to fill in as our spare and we were going to be able to row later. We had a couple more erg relays with some Chinese students and masters rowers before heading off to lunch. After lunch we came back to the boathouse where some of us got the opportunity to speak with Chinese students in small groups. It was striking how much they were focused on education and college at such a young age, some of them were only 12 and 13 and were asking about whether or not BC required SAT II subject tests. Hearing about their daily lives at school was also pretty striking as some of them went to school for close to 13 hours a day. From left to right: Gavin Cunningham '21, Henry Hawley '20, and Alex Chansky '19 engage with the youth. After this small group interaction wrapped up it was time to head to the boat bays and get ready to launch. It was blisteringly hot out, and thankfully the regatta officials decided to shorten the race from 8,000 meters to only 6,000. With a substitute in the boat, we were a little nervous when launching, but seeing how hyped up Alex (Dillon) was brought everyone's spirits up and we were ready to race. The first 2K flew by and before we knew it we had come to the bridge that signaled the turn around point. With no crews around us to cause concern for a collision the only drama came from my oar popping out of the oarlock while attempting to spin. With my oar back in place and the spin completed we went charging down the final 3K trying to gain some ground on Sydney and UBC and push the British crews as far back as possible. A Chinese quad joined us for the last 2K and stuck with us for a little while. We resolved as a crew to drop them, and brought the rate up and finished lengths ahead of them. UBC won the race pretty handily, but Sydney managed to pip us by a second, which we were pretty happy with given the pedigree of Sasha. Step 1: Grip. Step 2: Rip. Featuring Alex "Tiny" Dillon in six seat. As soon as we put our boat away we were ushered back to the dock for a dragon boat race! Ken divided all the teams into two groups and told us we were going to have a 500 meter race. Everyone except Sophia ended up in the same boat with some rowers from Oxford and Cambridge. This was many of our first time in a dragon boat, and given this race was only for bragging rights we found some members of the boat to engage in some light paddle splashing before the start. After cheekily shortening the race a hundred meters or so we were off and our boat managed to surge ahead, finishing lengths ahead of everyone else. With the dragon boating wrapped up we were off to the hotel for a quick shower before heading off to a barbeque. Another wholesome family photo after the dragon boat race, again featuring Foster Child Adam from Harvard. The barbeque and bus ride back to the hotel were possibly my favorite memories of the trip. Ken had told us to bring bathing suits to the barbeque place and upon arriving we were treated to the sight of a massive pool with long banquet tables set up on an outdoor patio with a DJ booth and a stage. The food was awesome, featuring some skewered meats, spicy seafood, chicken fingers and fries. After dinner trophies were awarded from the race earlier in the day and Ken asked us to perform the cha cha slide again. Us and our good buddy Ken Lee, moments before we we threw down another show-stopping performance of the Cha-Cha Slide. A few minutes later someone hopped in the pool and pretty soon almost everyone was in the pool and a DJ came out and started to play music. The Aussies showed a particular adeptness at stacking people on shoulders and managed to make a tower four people tall. The night at the barbeque wrapped up with a good old fashioned sing along. Of course we had to make sure everyone was acquainted with the BC favorite “Mr Brightside”. After a hearty effort from everyone we were ushered back to the bus where we continued to belt out songs all the way back to the hotel. On Wednesday, we began our day by traveling to the wonderful Slender West Lake of Yangzhou. The area surrounding Slender West Lake is a national park, located just northwest of the city’s center. Team Manager Emily and Coach Alex even saw a black swan, pictured below. We were granted special permission to row on the ponds there for the day, and were very privileged to explore the area by boats. We rowed past many historic landmarks all around the lake, such as the Five Pavilion Bridge and a building called “The White Pagoda”. A black swan spotted in the Slender West Lake park. Personally, I thought this was one of the coolest rows in which I have ever participated. There were many tight turns, bridges and dispersed swimmers that our coxswain had to navigate past. We were also rowing in mixed boats, so I had the opportunity to interact with bunch of students from Canada and Australia, hearing about rowing culture in their respective countries along the way. And a pretty neat building. Next, we returned to the hotel to pack our bags, and began our travel to Shanghai. Although it was almost a four hour bus ride, our pain was somewhat alleviated when we pulled up to a rest stop to find a Dairy Queen inside. In Shanghai, we checked into our hotel and went out to dinner shortly after for our last meal with all the teams together. While at dinner, we met up with one of our favorite coxswains, Camille. She happened to be doing an internship in Shanghai for the summer, so she didn’t have to travel very far to meet us. Knowing more Mandarin than the rest of us put together, Camille was able to help us by ordering things such as water and napkins, which we had previously been unable to do at all other meals. She was also able to explain some of the many questions we had regarding the authentic local cuisine. Thanks Camille! After dinner, our race organizer, Ken Lee, brought us to the Huangpu River. The river flows through the center of Shanghai, with an incredible display of many of the city’s skyscrapers in the business district. Among them was Shanghai Tower, the second tallest building in the world. Although it is barely visible in the picture below, it is the one lit up in blue on the right. Seeing so much modern infrastructure after hundreds of miles of farmland between every city to which we travelled was a big shock for me. We continued to enjoy the rest of our evening by walking around the area and going through shops to buy food and gifts for people back home. Lastly, we all gathered by the river again for another picture with Ken, before saying goodbye to Camille and heading back to the hotel for our last night in China. And that was pretty much it. The next day, we woke up early, said goodbye to our newfound friends from UBC and Sydney, and went for a walk around the neighborhood. We stopped into a few shops and grocery stores, picking up last minute souvenirs and taking in the morning scene. Before we knew it, it was time to go. We bid farewell to Ken (making sure he knew he was welcome to stop by a practice in Boston anytime) and boarded the bus. The bus ride from the hotel to the airport really drove home just how massive Shanghai is. Over thirty-four million people live in the Shanghai metropolitan Area. That's double the combined total populations of New York, Los Angeles, Chicago, and Houston. The buildings stretch on, and on, and on, farther than you can see. China was the biggest culture shock that we had ever experienced. We walked around the cities astounded by the size and grandeur of the buildings. We sat at every meal smiling and laughing as our comrades dared to try various Chinese delicacies with entertaining English translations (highly recommend the “juice of juice” and “beancurd with one thousand pages of red fever”). I sat next to Alex and Sophia on the train ride to Yangzhou, mesmerized by the random high-rise complexes scattered among the beautiful Chinese countryside. We were dumbfounded as some Chinese secondary school students told us that they attend up 15 hours of school a day. At some point of every day, I caught myself thinking, I have no idea what is going on here. I’m not quite sure why, but this is incredible. BC Men’s Rowing was way out of its element in this new culture. China was a whirlwind of confusion, crazy food, stifling heat and humidity, and endless questions. At some points, we were uncomfortable with this new environment, but we all dove into the uncomfortable experience to learn something new about China and about ourselves. All eleven of us now have a special bond from the memories we made with each other, the other crews, and the Chinese people. Yet, despite all our questions, the one thing every member in our boat knew for certain was how to compete. Once we got on the water, things made sense. As we sat waiting for the first race, I sat in my seat thinking, this is happening. We’re in China. Let’s show ‘em what we’ve got. This common experience of rowing and competing brought every crew together. No matter the country of origin, background, or skill level, every rower at this regatta showed up to the start line as equals. 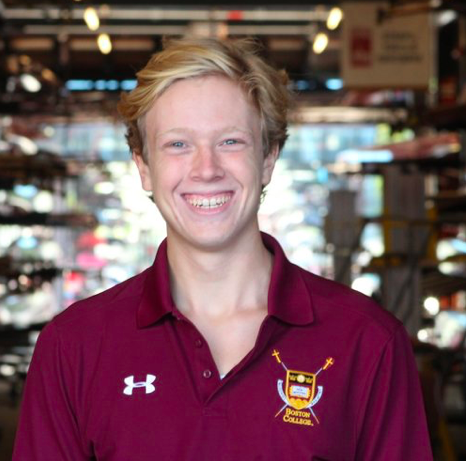 Having only started rowing at Boston College, I never expected that the sport would take me across the world to compete with some of the best international crews. We are incredibly thankful for the opportunity to race internationally while immersing ourselves in one of the most shocking weeks of our lives. This trip wouldn’t have been possible without the help of several people and organizations. First, thank you, Ken Lee, the Deep Dive Rowing Club, and the Organizing Committee for their countless contributions to the regattas. Thank you, Emily Charnowski and BC Campus Recreation, for putting in endless hours coordinating all the logistics and administrative work throughout the whole process. Thank you, Caitríona Taylor, Kelber Tozini, and the Center for International Higher Education for organizing our cultural seminars before and after the trip. Thank you to the other crews at the regatta for making great memories and sharing endless laughs with our team. Thank you to Alex Dillon for his work as head coach and last-minute substitute in Yangzhou. Last, but certainly not least, thank you to every one of my teammates on this trip. Matt, Sean, Kyle, Alex, Alex, Sophia, and Steven, thank you for making this unforgettable trip as special as it was!